Movies. They’re a big part of my life. My personal DVD and BluRay collection contains more than 2,000 titles. Very few of them, however, were made in the last decade. This isn’t because I don’t want to love everything I see. It’s because I can’t. Frankly, most of the films I’ve seen in the last 10 years bore me to tears. There are always exceptions—six or seven films that genuinely excite me each year. 2012 was different. The best year in cinema since 1999. Some will undoubtedly disagree, and that’s cool. But I didn’t hallucinate my enjoyment of the following films, and it’s my hope you’ll dig the spirit of this list. Full disclosure: I am not, nor do I wish to be, a film critic. I don’t discuss film by way of synopsis. Sometimes I have a lot to say and other times I find it hard to articulate how and why art moves me. I’m not interested in analyzing what I love. I just know it when I see it. I love creation, and that’s what Cloud Atlas is. Though this film hasn’t received the wide acclaim it deserves, I believe it will stand the test of time. Any blemish here is the product of ambition. This is art reaching far. And connecting! Visually stunning. Emotionally moving. And transformative. The century’s best film thus far. Ben Affleck. Damn, that man can direct! I saw Argo on its second day at a small theater in the Midwest. When it ended, people applauded. We’re not talking about an audience of fanboys who'd just watched their favorite comic book hero set to live action; rather, they came to see a film about the US government’s odd (but true) mission to rescue six Americans from Iran in 1979. Did I mention that everyone applauded?!? In my experience, that just doesn’t happen as a matter of routine. But Argo isn't the norm. It's a masterpiece. In just about any other year this would have been my favorite. In fact, Argo isn’t just my second favorite film of 2012, it’s my second favorite of the last decade. It manages to be suspenseful though we know what’s going to happen, and the Hollywood stuff is hilarious. My general distaste for romantic comedies isn’t rooted in cynicism. I love to love and I love to laugh. But most rom-coms are lame as hell, neither funny nor believable. Here we have David O. Russell’s brilliant Silver Linings Playbook, a film with a rare internal awareness about mental illness and the hard fought road to a second chance. What you won’t find are a series of pratfalls resulting inexplicably in happily ever after, though you will find a film that’s incredibly cognizant when it comes to clichés. Rather than avoid them, Russell does something more interesting—he plows through them with unbelievable grace, placing the focus where it belongs: the characters. You’ll hear everyone praise Jennifer Lawrence for her performance, and for good reason, but Bradley Cooper, Robert De Niro, Jacki Weaver, Chris Tucker, and Anupam Kher are all outstanding. I truly loved every frame of this perfect film. It could be said that Quentin Tarantino has been telling the same story since the first Kill Bill, trying like hell to make the perfect revenge film. I, for one, hope he does something new next time, but that doesn't mean I don't love Django Unchained. Reservoir Dogs is QT's paciest film and Pulp Fiction is his coolest and Jackie Brown is his most mature. But what we have here, in my humble estimation, is his best film. Some have knocked the violence, others have criticized the film's unflinching and direct approach to exposing racism, and a few have cited problems with the motivations of characters (particularly Dr. King Schultz, played by Christoph Waltz). Go figure, QT didn't make this film in the vacuum of political correctness, and he didn’t feel the need to spell out a complex character’s thought process when he could show us the man’s odd internal logic through action. Why are some so shocked? Are they just now tuning in? Fact is, most people get it, and Django Unchained has done very well. Now QT can do something new? Again, hope so. Zero Dark Thirty is a challenging and exhausting film. It’s also a major achievement, despite the controversy surrounding its accuracy. Jessica Chastain’s performance is the finest of the year, and it’s the best thing about an enterprise that clearly isn’t seeking to entertain. That aside, Zero Dark Thirty is a compelling and indispensable government/military procedural that examines obsessive determination in the face of bureaucratic incompetence and indifference. Does the film justify torture? Not in my mind. Most of us have no firsthand experience when it comes to the horrors and politics of war. This is a glimpse into that dark abyss, and it’s also a mirror. This is who we are, it says. This is what we do. Even if Bigelow (director) and Boal (screenwriter) are guilty of connecting dots erroneously, they nailed the tone and mood. And they made a great film. I’m a Bond nut. I grew up with 007 and have watched all of the Bond films (with few exceptions) hundreds of times. I disliked 2008’s Quantum of Solace (one of the worst in the series), but I love Skyfall. ‘Nuff said. Simply put, Looper is cool. But it has plot holes, you say. Fair enough. Now show me a time travel thriller without a few plot problems and I’ll introduce you to Santa Claus. The focus here is on the characters, which is probably why I didn’t see the logic gaps on first viewing. That’s right, plot isn’t king in Looper. How utterly refreshing for a sci-fi thriller set in a dystopian future where the mob uses time travel to dump bodies. Joseph Gordon-Levitt and Bruce Willis turn in terrific performances, but child actor Pierce Gagnon, who plays Cid, steals the show. Sometimes I love Wes Anderson’s films (Rushmore, The Royal Tenenbaums), other times not (Bottle Rocket, The Life Aquatic with Steve Zissou). Moonrise Kingdom fits somewhere in the better half of Anderson’s oeuvre. What we have here is a charming and funny fairytale that's beautifully rendered. I loved it. Killing Them Softly is a smart anti-thriller that explores the modern economic collapse through the lens of organized crime. The snappy dialogue is worthy of William Goldman in his prime. The film’s sole flaw is its heavy-handed use of radio and television footage to clarify its point. That aside, Killing Them Softly is a profound work of art. five works, they will proceed directly to the Final Ballot. I still can't get over what an amazing year 2012 has been for me. I'm extremely grateful to everyone who has purchased my work, and for all the kind words and encouragement I've received along the way. 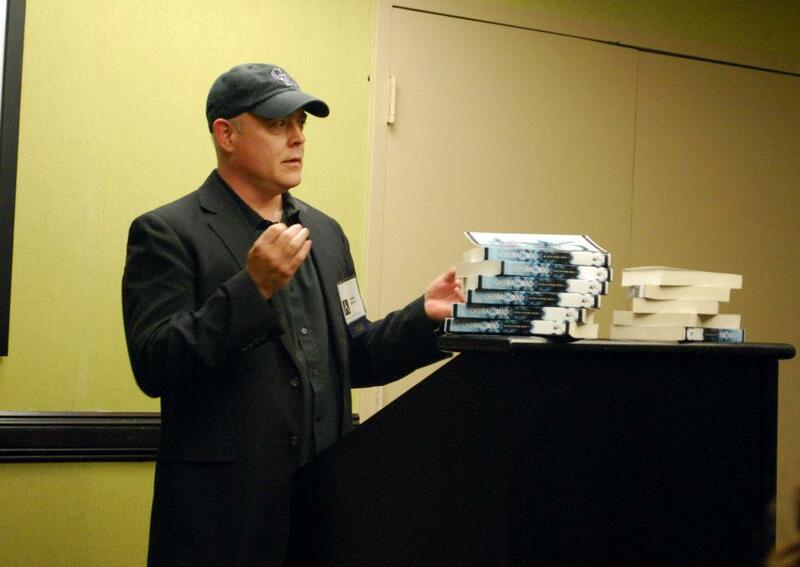 2012 saw the publication of two of my novels, two novellas, and two anthologies I edited. 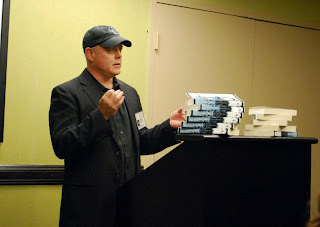 I made 2 professional fiction sales and had the honor of working as the editor of three remarkable novels: Inheritance by Joe McKinney, Seraphim by Jon Michael Kelley, and The Quarry by Mark Allan Gunnells. 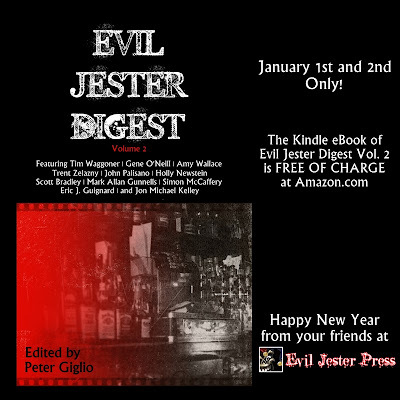 I also oversaw the production of more than a dozen fine books from Evil Jester Press, with a range of duties, including graphic design, formatting, proof-reading, contract negotiations, slush pile warrior, etc. What a year! I don't know if I can match that pace in 2013, or even if I should try, but I do know I'm in a far better place than I was in 2011, and I'm grateful to so many people. The Amazon link to download Evil Jester Digest, Vol. 2 is here. Included are 12 dark tales from masters and rising stars of genre fiction. It is our hope that you enjoy the book. Of course, Amazon and Goodreads reviews are appreciated, as well as good old-fashioned word of mouth. But the most important thing is that you know how much we appreciate your consideration. Without further ado, I would now like to turn the stage over to eight of the anthology's esteemed contributors. They have a few words to share about their stories. I try to write non-familiar monster trope pieces, but occasionally I like to slip back into the warm comfort of my favorite traditional horror genre: Zombies. The writing industry is glutted with zombie fiction, and I didn’t want to put out another gore-filled undead slasher. I wrote my story, “A Curse and a Kiss” with zombies taking more of an incidental or background role. The story itself is a variation of the fairytale “Beauty and the Beast,” told through the eyes of a servant. 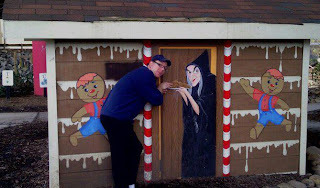 I have always been a lifelong fan of Grimms' Fairy Tales and Aesop's Fables. The original telling of “Beauty and the Beast” is much darker than the “Disney-fied” version, and I wanted to bring the story back to its original tone and message, though I changed the curse placed on the Prince to becoming transformed into the “Living Dead” rather than an animalistic beast. "Coyote Gambit" is the earliest of the Cal Wild stories. The series actually begins rolling with the introduction of the character, Karch, who is nicknamed the Armless Conductor. But this part of the series is actually quite along in time after The Collapse. So a novel down the road, The Confessions of St. Zach, will begin right after The Collapse and develop the early part of the series. But "Coyote Gambit" is the only immediate short story. The series really took form after I decided that we needed a modern argument of the philosophy underlying McCarthy's fine novel The Road. I like the book but don't agree with the writer's view of human nature in crisis. Cal Wild books and stories support my view of human nature. But "Coyote Gambit," especially the gruesome implication of the ending, is closer the harder edged view of The Road than my more humanistic beliefs. It's not a story for the faint hearted. Let's face it, we're all addicted to technology. I certainly am. However, I also grew up in a time when no one had cell phones, there was no texting, no Facebook, no Instant Messaging. Therefore, as much as I love technology, I also feel I could live without it if I had to. However, when I look at young people today, kids that were born "plugged in" as it were, I wonder...could they survive if their technology was taken away? I decided I wanted to explore this in a story, and satire seemed the best way to go. Taking the idea and stretching it to an extreme and absurd to get my point across. I was happy with the result, hopefully readers will like it as well. Slink: Though in a contemporary setting, this was an attempt to write a story that might have hopefully been accepted and published by Black Mask, maybe in the forties, at some point before its decline and eventual demise. (left)The great Trent Zelazny ensconced in kitties! "Kristall Tag" had its genesis in what I learned about the fall of Berlin and the invading Russian Army. What if there were a major outbreak happening in our sister country Mexico? How would we guard our borders? With what? Would we help, or just protect our own interests? And if said outbreak had fangs, then what? One young man discovers the illegal alien task force he's joined is just a cover, and that the border fence being constructed is crucial rather than just misguided patriotism. With "VAMPIRO," playing with themes of xenophobia and self-loathing seemed interesting. Some have indicted the story as a simple comment that illegals are vampires. Take a bigger bite. There's more under the thin, translucent skin. at Dark Delicacies in Burbank, California. Should we start a band? The genesis of "Vanishing Act" was an article I read in the mid-1990s about poor deluded Sarah Winchester and her bizarre Mystery House. Writers are almost always voracious readers, and there's an unconscious filter that is always sifting through everything for the kernel of a new tale, like a whale sucking in thousands of gallons of seawater for specks of zooplankton. (below) Simon McCaffery, working on his tan. I was fascinated by the true story of an educated, wealthy, devout young woman whose mind is stripped and driven to such extremes by grief and a fear of the afterlife. I knew I wanted to weave it into a story, and I made a couple of poor attempts, but eventually set it aside. The vivid story of Sarah and her mad, marvelous house of many doors remained in my imagination. I also had toyed with a potential novella or novel about a desperate father searching for a vanished son, and the idea of certain very rare individuals capable of conjuring unseen doorways between worlds, driven by an intense desire to escape from unhappy lives or relentless will to be reunited with the lost. And these ideas finally collided, with the resulting story. 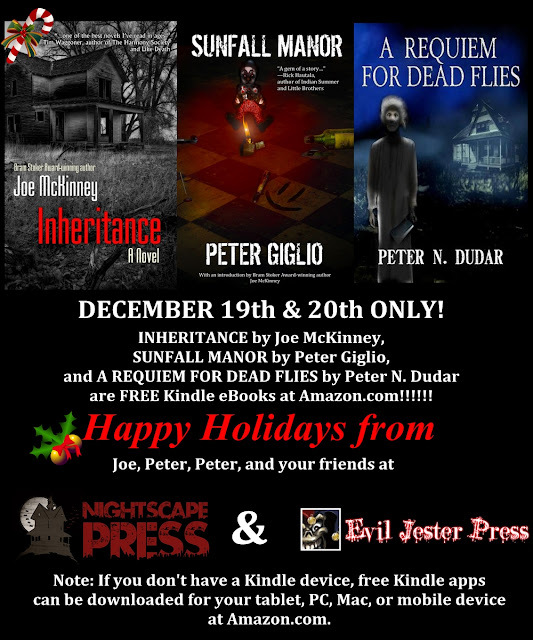 I'm thrilled that it worked for Peter and the Evil Jester Press crew, and proud to appear among so many talented writers I admire. The human heart is a funny thing, and fear and obsession can lodge there and grow like dark cancers. And how many doors do we open and pass through in a lifetime, without a second thought? I was wrong. Oh, how I was wrong! Not only did I have a hard time finding inspiration in the ensuing months, I found it even harder to sell the few stories I did write. I was frustrated. Having learned a few things about the biz now I see what a baby I was being. But in that moment, I was sure my first fiction sale had been a fluke and that I would never publish another word. During this time I wrote a short story that I liked—that I still like—about a strange creature who encounters a young girl held captive in a cellar. It was called “Reaching for the Light.” And the title expressed exactly how I felt. 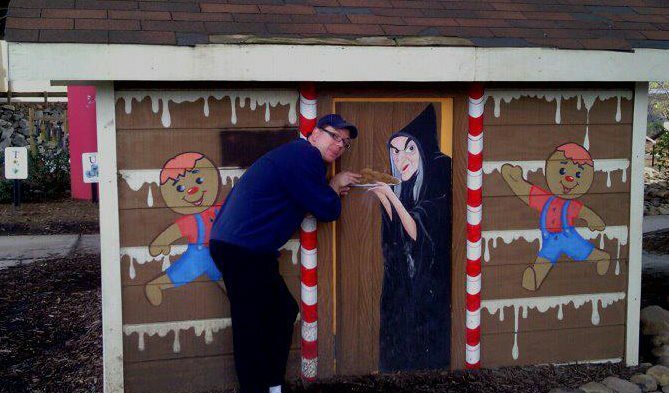 But, for some reason, I couldn’t shake the image of the girl in the cellar. I wanted to do something different with this cliché and thought there was a deeper story to be told than the ones I’d read or seen in movies. 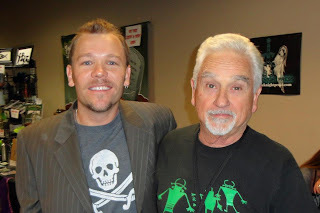 Sometime later I started writing a story aimed at Robert Essig’s Through the Eyes of the Undead II. And I did something that I was pretty sure hadn’t been done before; I made the girl in the cellar a zombie. The story was called “Half Life” originally and, for the most part, it's the finale of what would later become Balance. And, damn, I was proud of that story. In fact, I loved it! So I sent it off to every friend I could think of who might want to read it. And many of them did. It got a flurry of great responses, but with one consistent bit of criticism. It needed to be longer. Everyone wanted to know what The Blast was. And everyone wanted to know more about the human relationships in the tale. I was just glad they liked the story, so I sent it off to Robert. And he liked it, too. It looked like my short story might be accepted and my dry spell would come to an end. But in the weeks that followed, the feedback I had received from trusted friends rang through my head. So I pulled up the story. Reread it a dozen times. So I expanded “Half Life” into a novella called The Blast, pulled my story from Robert’s short-list, worried I’d lost my mind, and sent the new draft to Eric Shapiro, the most trusted of my readers and the person who’d given “Half Life” the biggest thumbs up. Eric was surely going to love this new, expanded version of a story he’d praised. I was on my way to becoming the master of the macabre... Delusions bloomed eternal on that day, my friends. 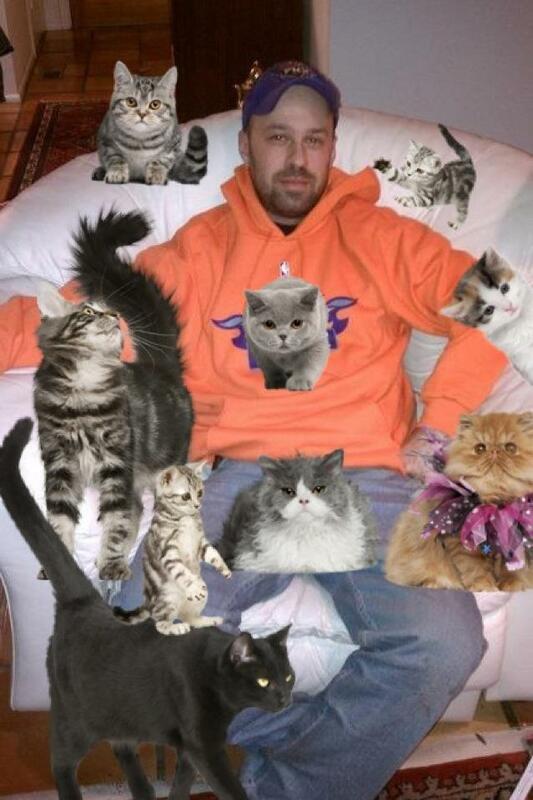 A few days later, I opened an email from Eric. I was excited and couldn’t wait to hear how great I was. I read his email and my jaw dropped. He didn’t think The Blast was so hot. He didn’t hate it, but he didn’t think it would resonate with readers or, for that matter, be published at all. Though surprised, I made one of the best moves of my life. And writers, whether you’re just starting out or have been doing this for decades, this is what we all need to do in these situations. Every time! I asked him what was wrong with it. I asked him for details. I asked for help. And he gave me what I asked for. And then his wonderful wife, Rhoda, read an improved version of the story and she gave me even more feedback. So I fixed the story. And then I fixed it some more. Then…Well, you get the idea. I just kept fixing it until everyone—and by everyone I mean Eric and Rhoda (two of the most wonderful people on the planet)—loved it! Then Eric gave me one last piece of advice. He told me The Blast sucked as a title. I asked him how bad it sucked, and he told me it sucked big. Really big! I love my honest friends. If you’re one of those friends who tells me what I want to hear, stop now! Unless I look really needy at the moment, if you want me to love you more, tell me what you really think. I came up with Balance. And the moment that title entered my mind, I knew I had it. Why hadn’t I thought of it sooner? I now can’t imagine this story ever being called anything else, but when you’re really close to something, it’s easy to be blind. Eric and Rhoda agreed with the title. And so Balance was born. 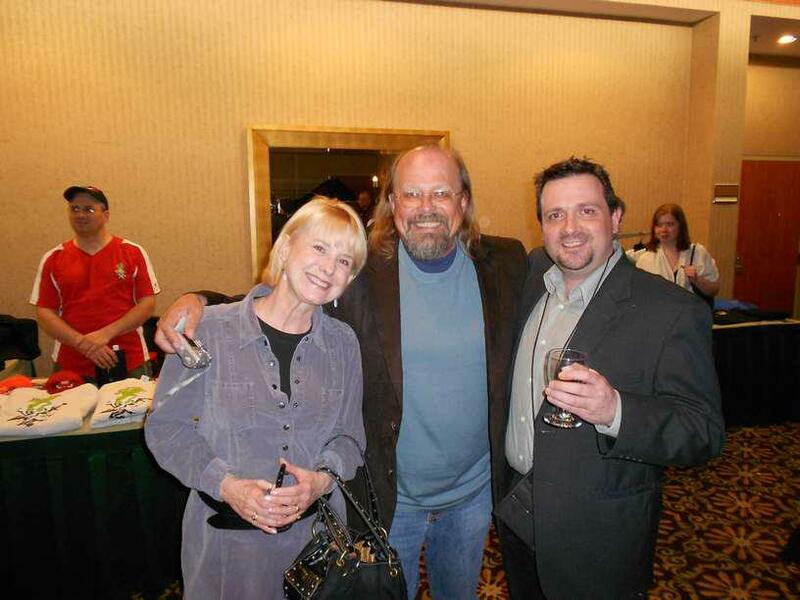 Special thanks go to Eric Shapiro and Rhoda Jordan. They’re busy people—making movies, writing books, building a family—and they certainly didn’t have to take time out to help me. But they did. And I’m forever in their debt. I learned a lot working with them. I learned to give a little more. 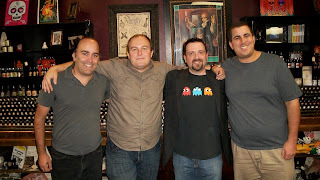 I sold Balance to an epublisher in early 2011. The eBook is still with them, but they didn't buy print rights. 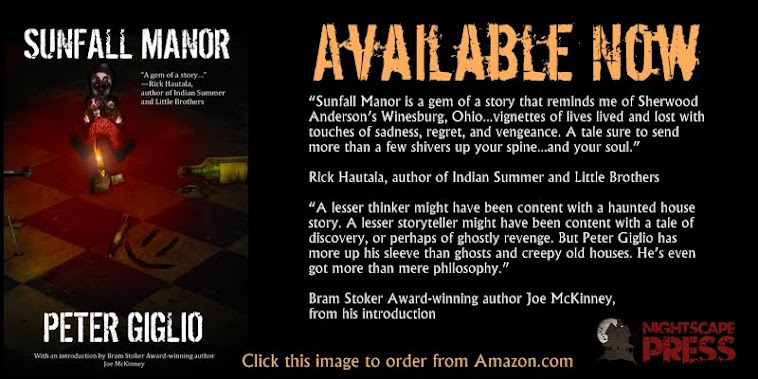 In early 2012 the paperback edition was released with Evil Jester Press. Though the few people who have read this novella have given it its share of praise, the book has never found a wide audience. It is, in fact, my worst selling title. 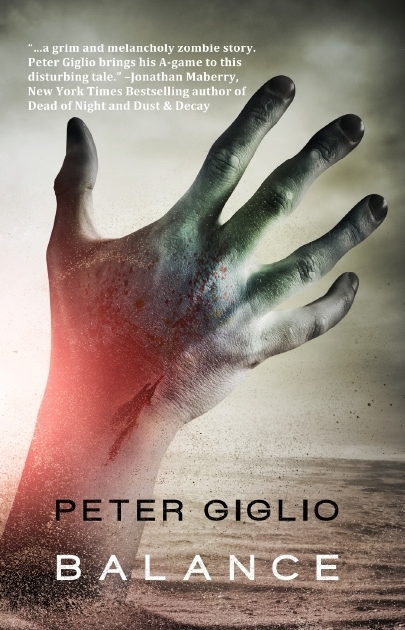 Though I'm not known as one who writes a lot of zombie fiction, I found that surprising for a long time. Then I took a look at the cover. Really looked at it. Hard. And I remembered what Eric told me about my original title. 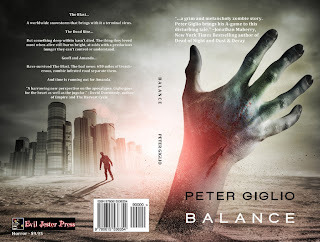 That title sucked, and so did the cover on the paperback edition of Balance. So Balance just got a facelift. At least the paperback did. Much as I'd like this cover to be on the eBook (I do love it), I have no control over that. One more thing: The paperback contains an introduction by Eric Shapiro and "Reaching for the Light" is included as a bonus story. You won't find these things in the eBook. 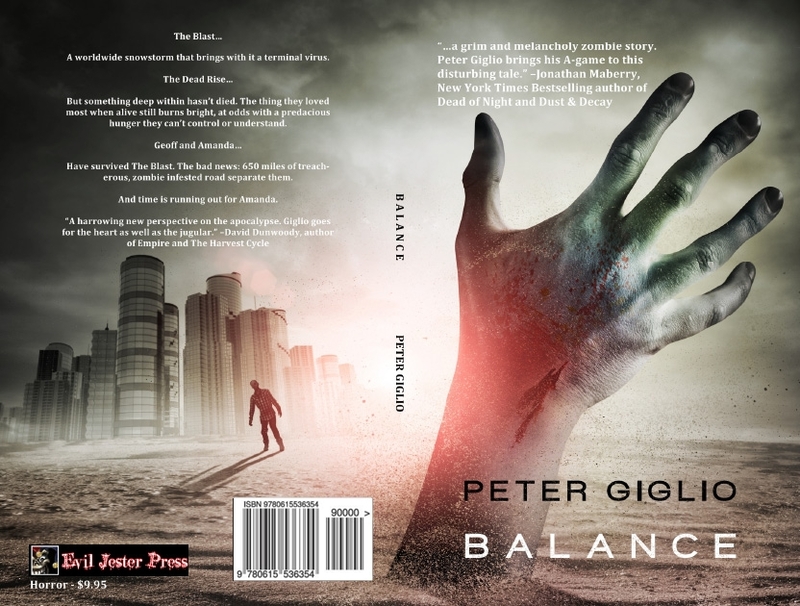 You can purchase the paperback of Balance at Amazon.com for only $8.95 here. 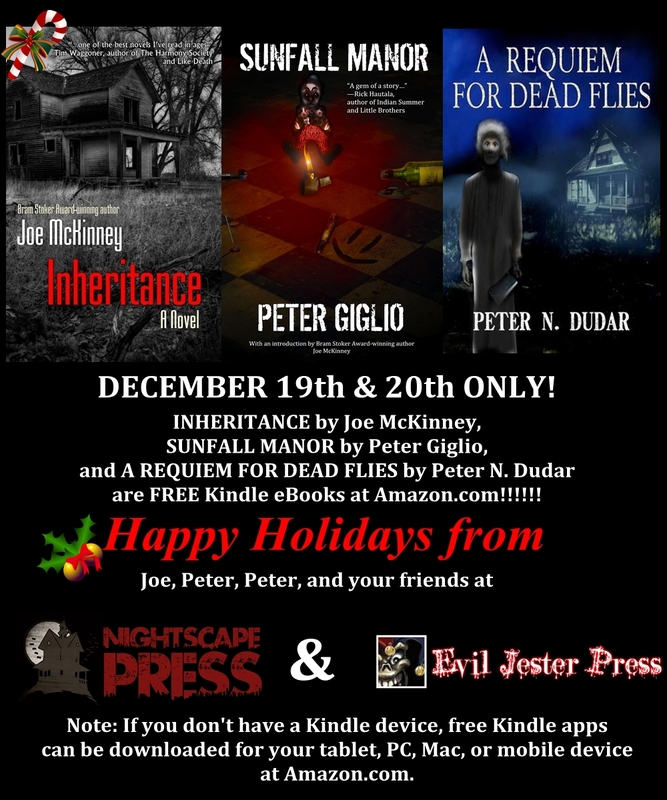 Joe McKinney, Peter N. Dudar, and Peter Giglio: The "Blogging the Ghost" Guys Return with Special Holiday Presents for You! 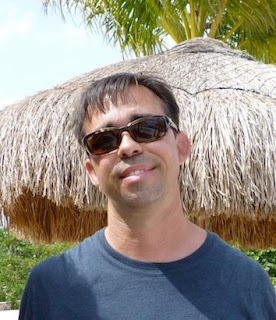 Joe McKinney, Peter N. Dudar, and Yours Truly mounted a successful series of blog posts back in September called "Blogging the Ghost." We talked about our new paranormal horror titles, shared free stories, gave away some prizes, and invited some pretty cool folks along for the ride. Now we're back, sharing essays about the writing life, wishing you all a safe and warm holiday season...and we even brought some presents! We hope you enjoy these titles. And for the many folks who supported our efforts in 2012, thank you. That’s a valid question, and one I’ve answered more times than I care to count. I’ve prattled on endlessly about how horror fiction lends itself to socially relevant metaphors, how being in tune with darkness can put one more in touch with light, how horror is the perfect canvas on which to paint conflict. As a reader, I don’t care if your story is horror or romance or a thriller or a literary coming-of-age tale; if it hooks me in the first page, I’ll read more. If it holds me in its grip, I’ll recommend it to anyone willing to pay attention. I don’t care if you have a contract with a Big Six publisher, a small press, or if you self-publish (as long as you hire a good editor!). Genre is essentially a way of keeping all the shelves at a bookstore (and the Amazon website) organized. It’s also a way of marketing: “If you like this, you’ll enjoy this!” The business side of me gets this and respects it. But that’s only half of me.